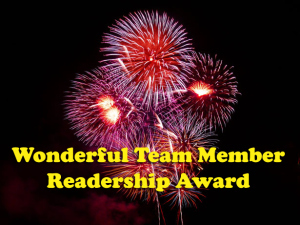 Thank you so much, Martina and Lori, for bestowing me with the Wonderful Team Member Readership Award. My blogging experience has already exceeded my expectations. I frankly didn’t anticipate the kindness and encouragement that the blogging community has shown me. I started blogging because I had so many thoughts, feelings, beliefs, and experiences that I wanted to share with others. Or at the very least, I wanted to get them out of my system. Blogging has become a helpful tool in my recovery from BED. Writing has always been therapeutic for me, and blogging allows me to reflect on my life, peel off my social mask, and expose myself in a vulnerable and honest light. It has also reminded me how much I enjoy writing. I write everyday – emails, lists, essays, notes, assignments – but it’s not often that I get to write from the heart. Here’s to more triumphs, more setbacks, more baking, and more writing from the heart. These are the treasures in my life. Thank you for your sweet words Kristen, and again, congrats!! Thank you again so much for the nomination Kristen! I will be posting mine soon 🙂 xox keep up all your amazing work.